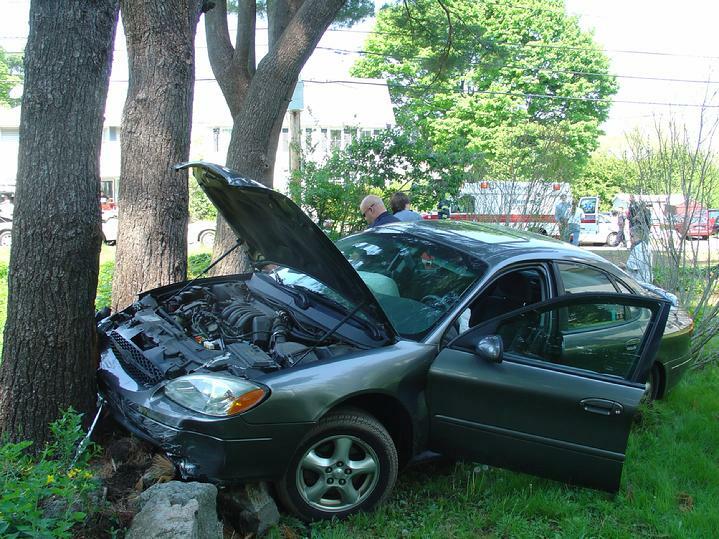 At 1458 Engines 5 and 1 were dispatched to a report of a motor vehicle accident with personal injury at the intersection of Cabot St and Roosevelt Ave. Engine 5 arrived to find two vehicles involved including 1 vehicle approximately 40 feet off the road into a tree. Crews assisted Northeast Regional Ambulance personnel with two victims that were complaining of non life threatening injuries. Once the injured parties were removed, firefighters ensure the vehicles were safe to be towed and spread speedi dry on spilled fluids on the ground. At 1520, Engine 1 responded to 39 Story Ave for a report of a Carbon Monoxide Detector activation. Lt. Rideout and his crew used a CO meter to test the air and found high readings in the apartment. The source was quickly determined to be a gas stove that was not operating properly. Firefighters shut off the stove, vented the apartment and rechecked the air in the apartment for CO. No readings were found. The homeowner was advised not to use the stove until it could be replaced. At 1314 the Beverly Fire Department responded to areport of smoke coming from a house on Central Court. Upon arrival Deputy Chief Paul Cotter and Chief Pierce found heavy smoke coming from an area behind the home. It was quickly determined that an occupant of 17 Central St. was burning construction debris in a barrell. Firefighters from Engine 1 used a garden hose to extinguish the fire and advised the occupant that burning construction debris was illegal an advised not to have fires in his back yard again. 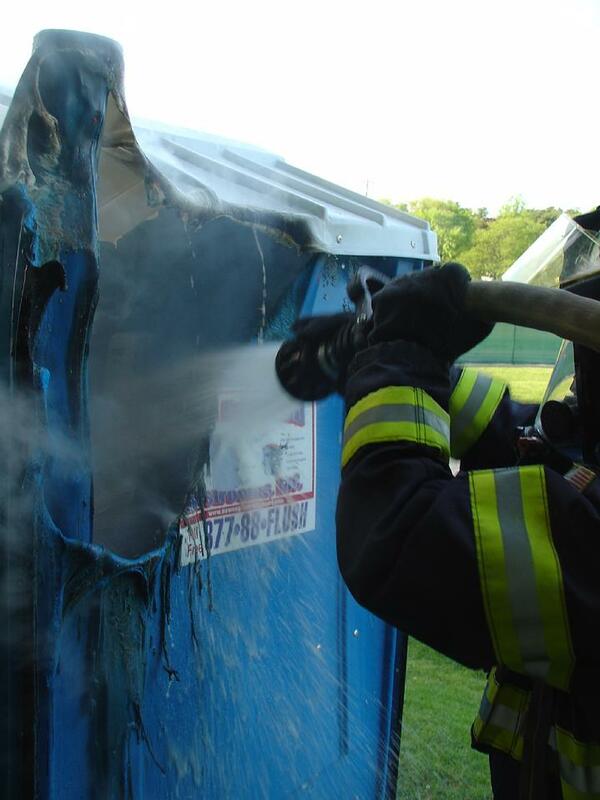 At 1758 Firefighters were dispatched to Cooney Field for a report of a port-a-potty on fire. Firefighters found a burning port-a-potty on the East St. end of Cooney Field by the stands. Firefighter Tom Lantych used 50 gallons of water and a hoseline to extinguish the fire. Fire Investigator Deputy Paul Cotter advised Beverly Police of the situation and officers investigated the incident. At 1816 Engines 1and 5 responded to a motor vehicle accident with injury at the intersection of Giles and Stewart Ave. Fire crews found a two vehicle accident with on occupant suffering a head injury from striking the windshield of his vehicle. Though the occupant was conscious and alert, he was packaged at the scene and brought to Beverly Hospital by Northeast Regional Ambulance for further medical attention. Beverly Fire Investigators have completed their work at the scene of the three alarm fire on Duck Pond Rd. and released the building to the Insurance Company investigators. �Though the fire remains under investigation, we have determined that the fire was not caused by a gas grill and believe the fire to be accidental in nature,� said Deputy Chief Paul Cotter. 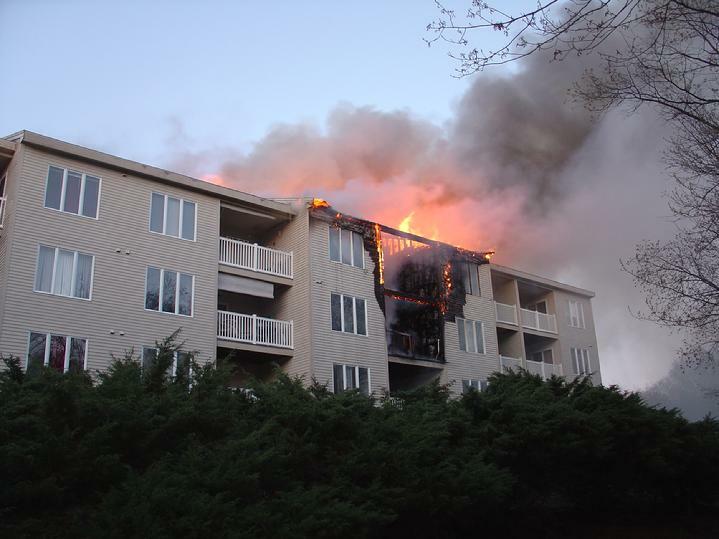 Though there was a grill on the balcony, no propane cylinders were connected to the grill and the grill could not have been in operation when the fire started. Other potential ignition sources are being investigated. Fire crews remained on the scene through 9 am May 5 dousing hidden fires. At 708 PM on May 3, Engine's 1,3 and 5 were dispatched to 2 Duck Pond Rd for a fire alarm activation. While companies were responding, several telephone reports of a building fire were received. Lt. Bob Bergeron arrived first with his crew on Engine 5 to find heavy fire showing from second and third floor balconies of two of the 35 units. Lt. Bergeron and his crew immediately extended a line to attempt to reach the fire. As Deputy Chief Petrosino arrived at the scene of the fire he immediately struck second and third alarms. As crews attempted to reach the seat of the fire, it became apparent the volume of fire and rapid fire spread in the common attic space was making an interior fire attack too hazardous for operating firefighters and the building was evacuated. As a defensive posture was assumed, Middleton Ladder 1 and Beverly Engine 5 set up their aerial streams. A total of four master streams were put in place for two hours before fire crews could reenter the wood frame and search for hidden fires. Crews remained on scene extinguishing hot spots throughout the night and next day. The cause of the fire, which caused damage to all of the 35 units and burned through the roof of the entire building, remains under investigation by Beverly Fire Department investigators and members of the State Fire Marshal's Office. One firefighter suffered a hand laceration while operating at the scene. Several pets were rescued from apartments, but at least one dog perished. All of the tenants were displaced. The American Red Cross responded to the scene and coordinated temporary shelter. At 0745 Tuesday, April 17, Engine 1, Ladder 1 and Captain Jeff Sirois responded to a report of a motor vehicle accident in front of 10 Boyles St. Upon arrival, Captain Sirois found a Chevy Van into a telephone with four occupants complaining of injuries. Firefighters assisted Paramedics from Northeast Regional Ambulance with extricating and treating all four victims who were transported to the hospital. The pole struck by the vehicle was severed and required the attention of National Grid. Engine 1 stood by at the scene until the vehicle was removed and the scene was safe. Throughout the day on Monday, April 16, the Beverly Fire Department responded to several storm related incidents. Ranging from trees down to carbon monoxide incidents, the Department responded to more than 30 incidents. 21 Hale St. for a tree down across cars. Besides the problem of falling trees and power lines, the power outages also resulted in the Carbon monoxide incident at 46 Grover St. The resident was operating a generator adjacent to the house which allowed the exhaust to enter the home. The firefighters responded and advised the generator should be moved away from the home to prevent the exhaust from entering and assisted with ventilation. 218 Cabot St. Natural Gas leak. Determined to be a pilot out on a stove. 14 Lindsay Ave Suspicious Device. State police called upon for further investigation. Firefighters stood by to assist State Police. 100 Sohier Rd. Building fire. An electrical problem sparked a small fire in the small building adjacent to the solar panels. Firefighters forced entry to the building and shut off circuit breakers associated with the extinguished fire. The Fire Department did not receive any reports of injuries associated with the storms runs. At 1623, April 7 the Beverly Fire Department received notification that there was a fire alarm activation at 50 Rantoul St, Gateway South. Upon arrival, Lt. Robert Bergeron and his crew on Engine 1 received reports of a fire on the third floor. When they arrived at the location, they found a fire in the hallway wall outside apartment 310. Crews quickly knocked down the fire with a fire extinguisher and opened up the wall to extinguish fire hidden inside the wall. The fire was confined to a small section of the wall. Fire Investigator Deputy Chief Paul Cotter is investigating the cause of the fire. Engine 5 was dispatched to <?xml:namespace prefix = st1 ns = "urn:schemas-microsoft-com:office:smarttags" />Broughton Dr. this morning, 4/8/2007, for a report of a car on fire. Firefighter Jeff Oneil arrived with his crew to find a Dodge Dakota with heavy fire in the passenger compartment area around the vehicles dashboard. Oneil and his crew stretched a hose line and used 250 gallons of water to extinguish the fire. The crew then used an axe to search the dash area for fire extension. Chief Pierce is proud to announce that the Beverly Fire Department was recently awarded $85,264 from the Federal Government through the Assistance to Firefighters Grant. The Grant provides nearly $450 Million to 4,500 Departments nationally. The Grant money was requested by Chief Pierce in order to purchase new portable radios for firefighters. The Department's current portable radios are becoming increasingly difficult to maintain, and replacement parts are often scarce. The new radios will also increase interoperability with other agencies by allowing more radio frequencies to be accessed. The Department will also purchase underwater communications masks for use by its Dive Rescue Team. The team currently has 3 masks for its 11 members. The masks allow divers under water to communicate with fellow divers and support personnel on the surface in order to relay important information about the incident. The masks also act as an added measure of safety for the divers. Congressman John Tierney submitted a letter of Congressional support on behalf of the Department. "This grant received the support of Congressman John Tierney," said Chief Pierce "his support was instrumental in our ability to keep firefighters safely communicating on emergency scenes". The total cost of the project is $94,760. The Federal share of the grant is $85,264 while the cost to the Fire Department is $9,476. The Assistance to Firefighters Grant is a valuable asset for Fire Department's seeking money to maintain and upgrade their capabilities.